In a recently published paper in the journal Progress in Earth and Planetary Science, PMEL’s Dr. Meghan Cronin collaborated with Japanese colleagues, including lead author Dr. Makio Honda, to conduct a comparative study of the ecosystem and its biogeochemistry using time series at the Kuroshio Extension Observatory (KEO) station off the coast of Japan. Combining data from the Japan Agency for Marine-Earth Science and Technology (JAMSTEC) sediment trap mooring with NOAA surface mooring data, this study shows changes in organic materials at the sediment trap are traced not only to springtime blooms, but also to cyclonic eddies that passed the site in the late summer-early fall. These eddies caused nutrients to rise into the euphotic zone, a layer closer to the ocean surface that receives enough light for photosynthesis to occur, and generate subsurface blooms that weren't detected by satellite. NOAA has maintained a surface mooring at KEO since 2004, and JAMSTEC has maintained a subsurface sediment trap at KEO since 2014. 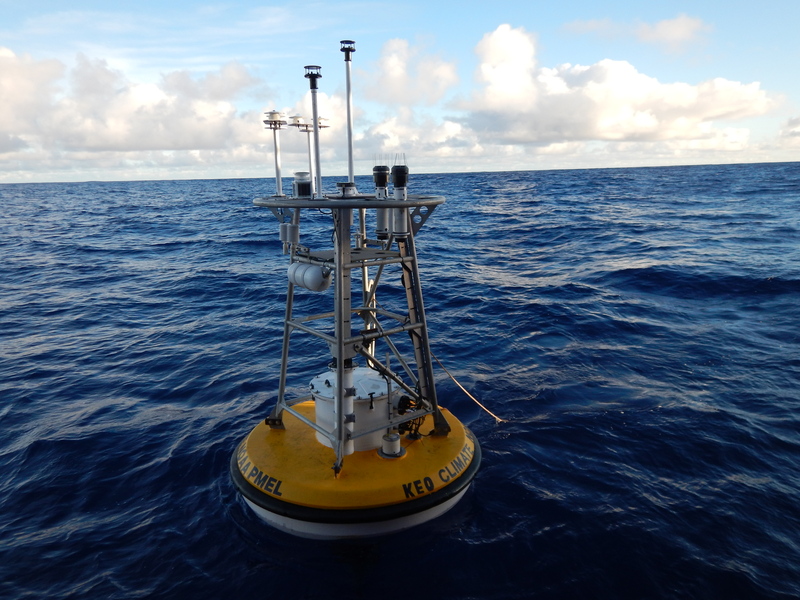 The KEO surface mooring carries a suite of instrumentation to monitor air-sea exchanges of heat, moisture, momentum (wind stress), and carbon dioxide; surface ocean acidification; and upper ocean temperature, salinity and currents. The combined data sets from both moorings enable computation of the physical and biological pumps of the carbon cycle in this key region of the North Pacific. As such, the site has become a focal point for international climate research. The working relationship between PMEL and JAMSTEC at the KEO site began in 2007, and continues to be a valuable partnership. Read the paper "Impact of cyclonic eddies and typhoons on biogeochemistry in the oligotrophic ocean based on biogeochemical/physical/meteorological time-series at station KEO” here.